View down to the Horse Tunnel. Holdoms Cottages also known as Myrtle Cottages are by the Horse Tunnel. 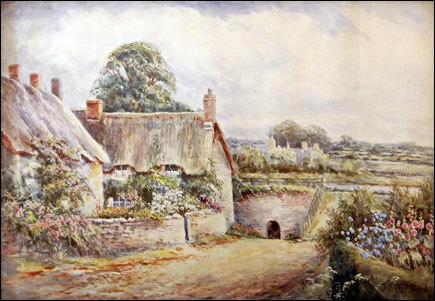 Mansel's Cottages also known as Panter's Cottages on the left. 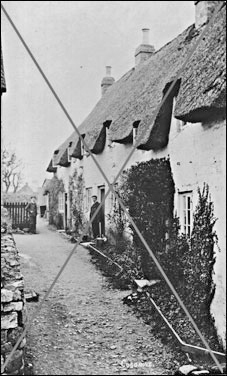 FOUR Stone-built and Thatched COTTAGES, one lately occupied by Mrs. Holdom, and three in the respective occupations of Messrs. Harding, Liddy, and Adkins. 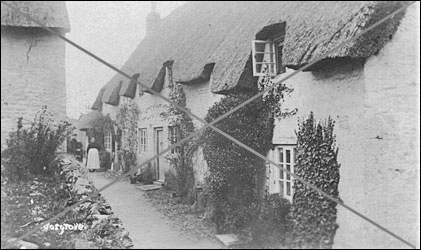 All those Four Freehold Stone-built and Thatched Cottages, pleasantly situated in the centre of the village, the one lately occupied by Mrs. Holdom containing living room, shop, two good bedrooms, scullery, and pantry; that in the occupation of John Harding containing two rooms above and two below: and the other two Cottages containing two rooms in each. There are four convenient boarded and thatched Wood barns and W.C. in the rear, with excellent front Gardens. The property is almost entirely surrounded by property belonging to A. Grant Thorold, Esq. Conditions will be produced at the time of sale, and any further particulars may be obtained of W. R. Parrott Esq., Solicitor, Stony Stratford; or of Messrs. Durham, Gotto & Samuel, Land Agents and Auctioneers, Newport Pagnell and Stony Stratford. Barley Mow on the immediate left. T. Bushell is on the sign over the door. 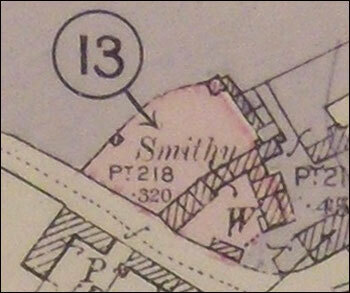 Myrtle Cottage were pulled down and a tannery company called Sharp and Woollards stood on the site by the horse tunnel. They came to Cosgrove in the 70s from Stony Stratford. They cured skins for the tannery business. That closed down in 2010. 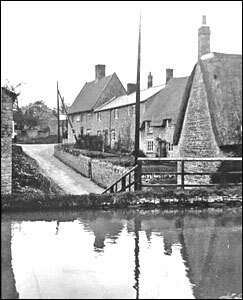 The thatched cottages along the canal are the rear of Myrtle Cottages. 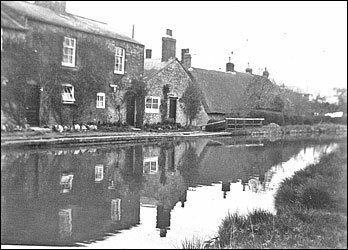 Only 20ft away from the canal, and below the level of the water, these cottages were often flooded when the water was high. 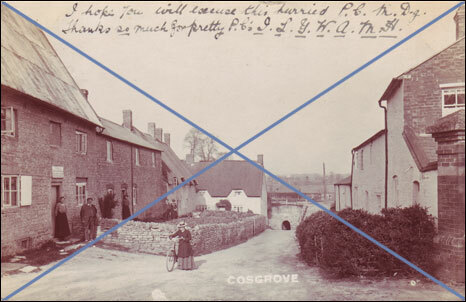 Brewery Cottages on the immediate left of this photograph. (Coloured Pink on Plan Inset). Let at a total Rental of £22 16s. per annum.